Okay so Pumpkin Pie isn’t really a ‘Thing’ in Australia. 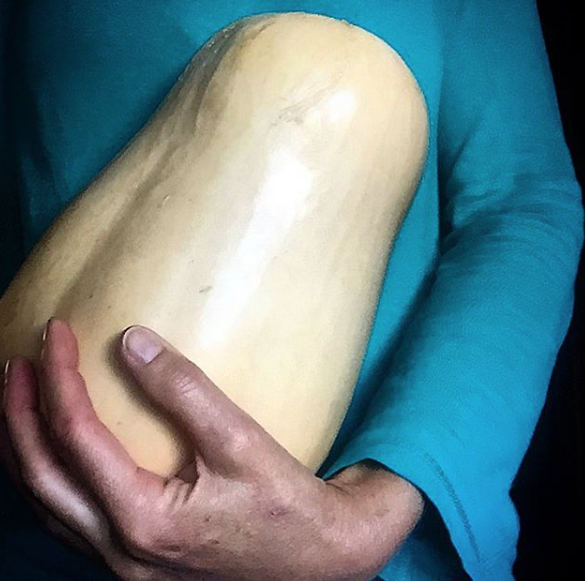 But when you’ve bought a butternut at the farmers markets that’s the size of a human baby, finding ways to use it all becomes a challenge. Especially when you discover that the one kilogram you require for a hefty batch of Thai red curry pumpkin soup leaves you still with two thirds of said vegetable to demolish! yep, that’s my big butternut! A friend once told me that pumpkin should only ever be roasted because “it brings out the flavour”. I discovered he’s dead right: the natural sugars caramelise and boost the veggie’s flavour incredibly. So I always roast it now, and often in quantities over and above anything I happen to be making at the time. That is to say, I roast extra so I’m prepared. 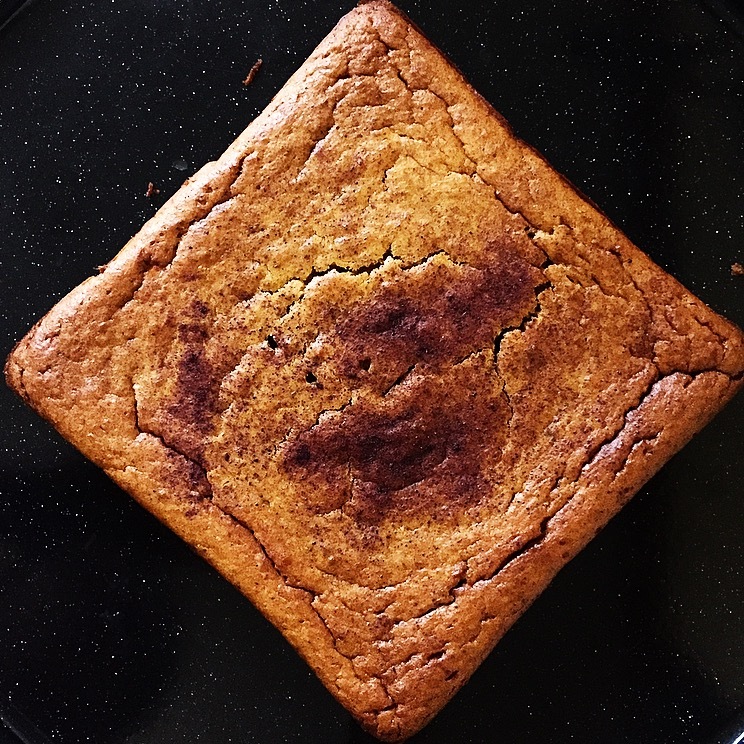 So, with a decent quantity of ready-roasted pumpkin chillin’ in the fridge, I ruminated upon its sweetness and wondered, “Could I successfully make a no added sugar dessert with it?” I considered how sweet the frittatas I made with it were. Could I make a kind of pumpkin ‘dessert’ frittata? That’s when I really began thinking about pumpkin pie… but I certainly didn’t want to have to make pastry for a pie crust. (Hell no! That’s way too much work!) Surely a blend of eggs, cream, some spices & that sweet roasted pumpkin could work? 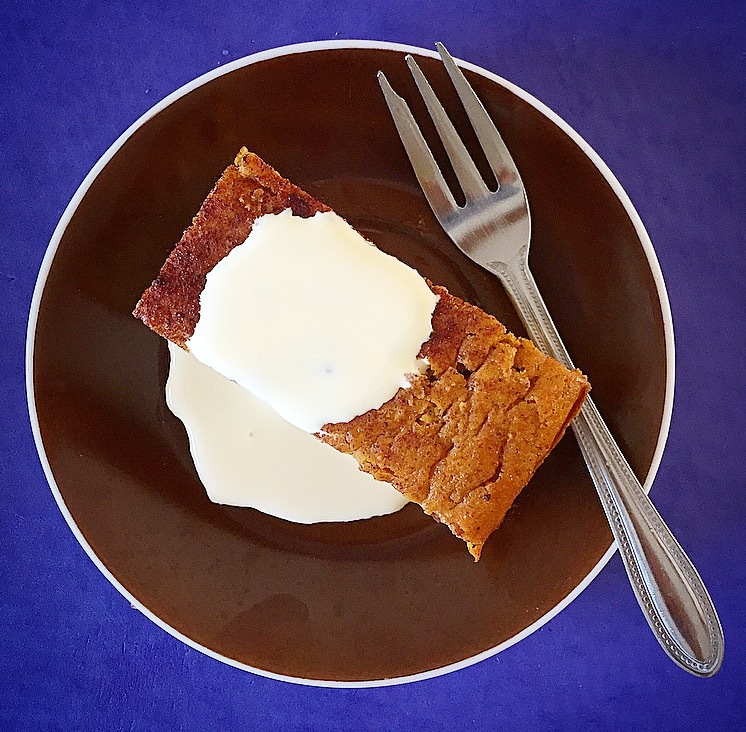 A Google search for ‘crustless pumpkin pie recipes’ revealed (apart from all of the results being American websites) that their ingredients were pretty much as simple as I’d envisioned. Most of them however use (ugh!) evaporated milk, egg ‘replacer’ or ‘substitute’ and of course, added sugar. God Bless America! Now, if you haven’t pre-roasted your pumpkin, the basic method is to preheat your oven to 200ºC, line a tray with baking paper then arrange skinned and roughly cut chunks of lightly oiled pumpkin (EVOO is fine even though you’ll be making a dessert… you won’t even notice the flavour after the roasting) and bake them for 20-30 minutes (depending upon the speed of your oven). Don’t burn them! If a skewer slides in easily & the centre feels soft, you’re done. It’s probably a good idea to let it cool a bit before moving onto the pie recipe. Preheat the oven to 180ºC and grease & line a baking dish/casserole dish or round cake tin with baking paper, then simply throw all of the ingredients into a food processor or high-powered blender and mix well. (Thermies: a couple of 10-20 second rounds on Speed 5-6, with some scrape-downs, should suffice.) Pour the ‘batter’ into your prepared receptacle and sprinkle with extra cinnamon, then cook for 40 minutes, or until a skewer comes out clean. NB: Because I used a smaller (16x16cm) dish, my pie was thicker so I let it cook for almost an hour. Bear in mind that a thinner pie = potentially less cooking time.